A Brilliant piece of statement jewerly,with soft black fabric rope, held together with gold details and as a crown piece the bouquet of beautiful rhinestones.Combining all the best things in one. 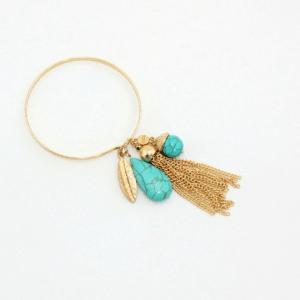 Bring your outfit next level with this turquoise colored bracelet. 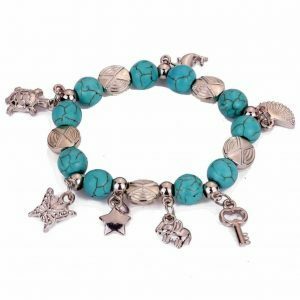 This beautiful bracelet is full of turquoise colored beads that are braided together. 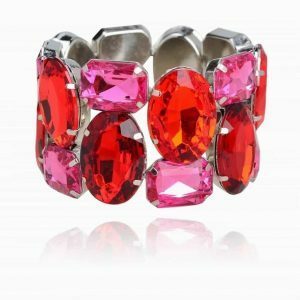 Mix and match this bracelet with other nice bracelets for an arm party. 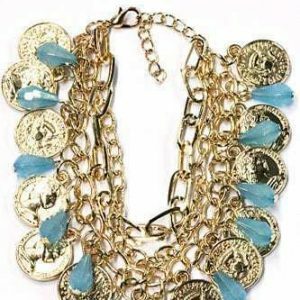 Combine it with other beautiful turquoise-colored jewelry. Finish your look with beautiful hoop earrings, or with a long necklace. It would also be nice with a stylish ring. 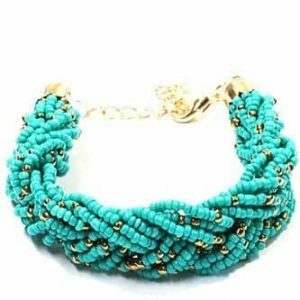 Do you have questions about the turquoise colored bead bracelet? Send us a message. 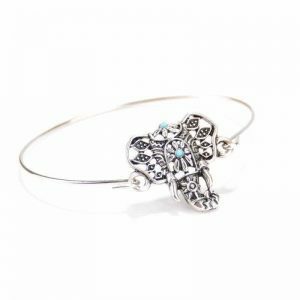 In the middle of this stylish bangle bracelet is a blue natural stone. You can open and close the bracelet. Mix and match it with other nice bracelets for an arm party. 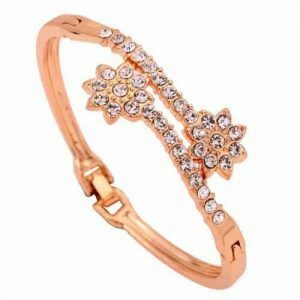 Wear this beautiful bracelet together with other nice jewelry. For example with a beautiful long necklace or with golden earrings. 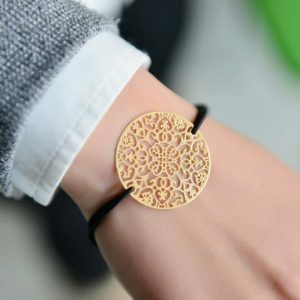 Upgrade your outfit with this bracelet. 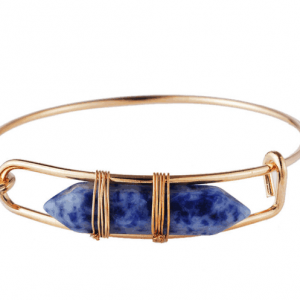 Do you have questions about the golden bangle bracelet with blue natural stone? Send us a message. 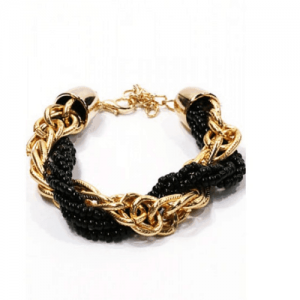 This stylish statement bracelet consists of 3 layers. On every layer there is a small crystal stone, a gray pearl bead and a black stone. Mix and match it with other nice bracelets for an arm party! Combine it with beautiful gold jewelry. For example with a long necklace or with a stylish ring. Do you have questions about this beautiful statement bracelet? Send us a message. 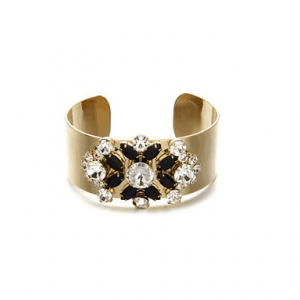 This cuff bracelet with spring hinge and rhinestones encrusted is the perfect addition for the hopeless romantic. .A smart and stylish way to soften your outfit and add a special detail. Timeless and neat, it can be worn with just about anything, taking you from a weekend brunch, to a midweek meeting, to a midnight party. 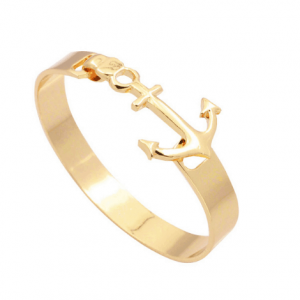 “Anchor yourself to something special” This beautiful golden cuff bracelet has an anchor design. You bring this outfit to the next level with this bracelet. Mix and match this stylish bracelet with other nice bracelets for an arm party. Combine it with other gold jewelry. 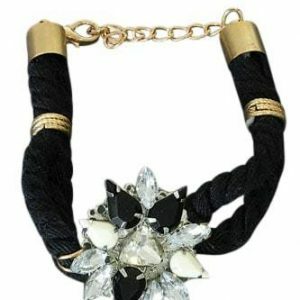 For example with a beautiful long necklace or with nice stud earrings. A lovely subtle ring will also be nice. Do you have questions about the statement bracelet with anchor design? Send us a message. 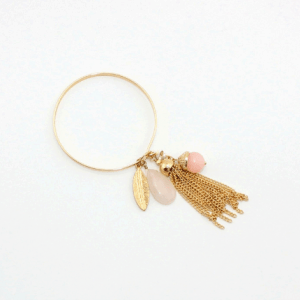 On this golden bangle bracelet hangs a large gold coin, and different colors of beads. 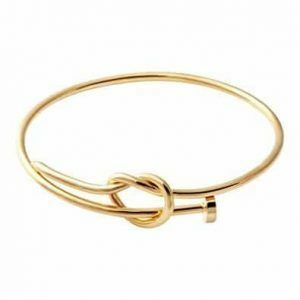 Combine it with other bangle bracelets for an arm party. Finish your look with other gold jewelry. For example, with a long necklace or stud earrings. A stylish ring would also be nice. 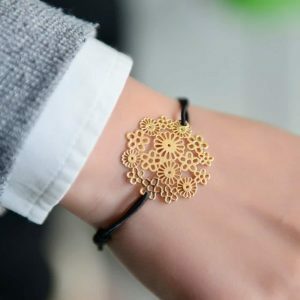 With this beautiful statement bracelet, you can bring your outfit to the next level. Do you have questions about the golden bangle bracelet with charms? Send us a message. We have a large collection of statement bracelets that will give your outfit an upgrade. We have statement bracelets in different shapes such as in the shape of a nail but also large bracelets with crystal stones. But we also have bracelets with separate shapes such as the anchor. 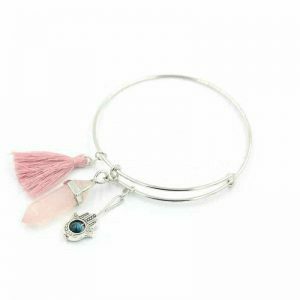 Are you looking for boho statement bracelets? then we have beautiful large bracelets with natural stones for you. We also have ethical bracelets with shells and beautiful stones for culture lovers. 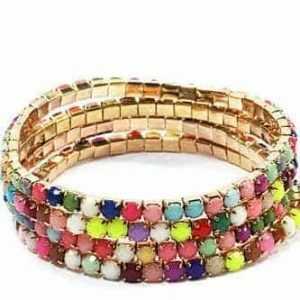 These bracelets are especially nice for a party, festival or just to cheer up your outfit.